Nico Rosberg has joined the 2015 Formula 1 World Championship fight with a superb victory at the Red Bull Ring in Austria. Rosberg beat team-mate Lewis Hamilton in a straight fight for the win, with Felipe Massa finishing third for Williams. 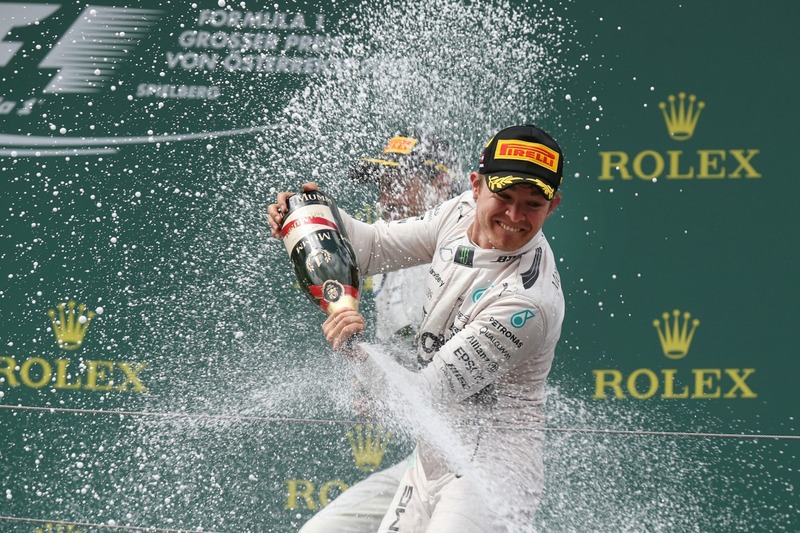 This is not Rosberg’s first win of the 2015 season – in fact it’s his third – but it’s a very significant victory. Why? 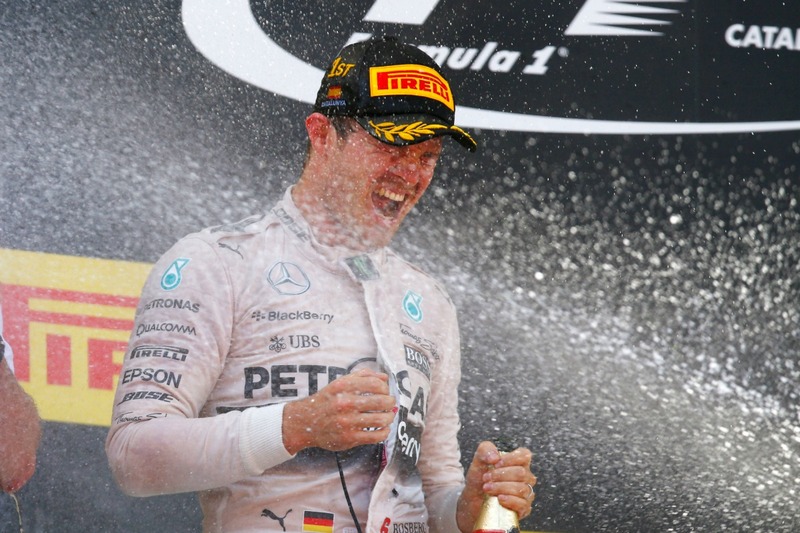 Because it’s the first time in 2015 that Rosberg has beaten Lewis Hamilton in a straight fight. It’s a psychological victory more than a points victory and it signals the start of what could be an epic battle for the Drivers’ Championship. Hamilton is the reigning world champion. He’s had the lion’s share of pole positions – 7 out of 8 races this season, with the other one going to Rosberg in Spain – and has been the man to beat in all of the races so far, winning 4 out of 8 in quite dominant fashion. And until today, it looked like Rosberg might not have an answer for Hamilton’s form. It’s true that Rosberg had already won two races this season, but neither would have been as satisfying as today’s win. In the Spanish Grand Prix, Rosberg drove flawlessly to win from pole position, but was never in a straight fight with his team-mate, who had a poor start and was stuck behind Sebastian Vettel for much of the race. In Monaco, Hamilton had the race firmly under control when his team called him into the pits at the wrong time in response to the safety car being deployed late in the race. Rosberg inherited the win, but it had clearly been Hamilton’s day. While a win counts for 25 points no matter how it is earned, Rosberg will have been aware that he had yet to beat Hamilton in a straight for victory this season. But that’s all changed now. In Austria, Rosberg made a stunning start to beat Hamilton (who was on pole) into the first corner. He then fended off a determined attack from Hamilton into turn 2 and again into turn 3 on the opening lap. Rosberg controlled the rest of the race to take a much-needed victory and close the gap to championship leader Hamilton to just 10 points. 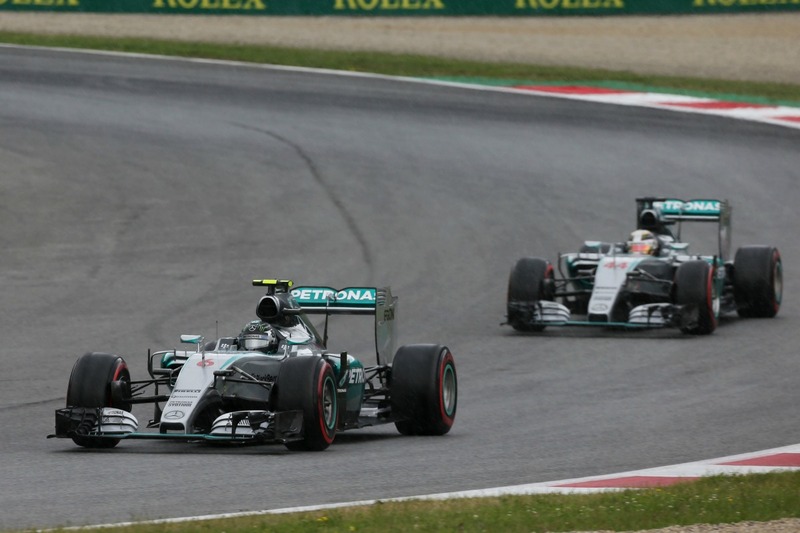 But perhaps more importantly for Rosberg, he had a wheel-to-wheel battle with Hamilton and won. In Austria, Rosberg was the better driver. Until today, it was hard to imagine Rosberg beating Hamilton to the title. But now it’s a possibility. Hamilton and Rosberg could be locked in a battle for the title reminiscent of Senna and Prost in the 1980s. Formula 1 just got exciting again. Mercedes have the fastest car in Formula 1 at present. That’s no secret. But just how fast is their car? It’s so fast that both drivers can go off during what should be their fastest laps in qualifying… and they still lock out the front row. That’s exactly what happened yesterday in Austria. Lewis Hamilton and Nico Rosberg were fastest and second fastest in the final part of qualifying, when they started their final flying laps, each attempting to go quicker. Rosberg was ahead on the track and on a quick lap. Hamilton put a wheel on the grass under braking for the first corner and spun, ending his chances of improving his lap time. Rosberg was up ahead, unaware that Hamilton had spun and pushing hard to try to take pole position. Going into the last sector of the lap, it looked like Rosberg might have just done enough to beat Hamilton to the top spot. But then Rosberg also went off, running wide on the exit of turn 8 before losing the back end of his Mercedes into turn 9. Although Rosberg managed to catch his car in time to prevent a spin, he ran out of space and went off into the gravel on the outside of the corner, which put an end to his session. In motor racing, the track typically (not always but usually) gets faster the longer a session goes on. That’s because the cars lay rubber down on the track on every lap they do. More rubber on the track means more grip, which means quicker lap times. That’s why the fastest lap in a qualifying session is almost always done right at the end, and the teams and drivers time their final lap to start at the last possible second to take advantage of the track being at its quickest. Yesterday in Austria, Mercedes didn’t need their final laps. That’s how quick those cars are. Even without setting a lap time when the track was in optimal condition, they were still faster than everyone else. Sebastian Vettel’s Ferrari was over a third of a second off Hamilton’s pace in third place, with no answer to the speed of the mighty Mercedes. Can anyone beat the Mercedes drivers in the race? We’ll find out this afternoon, but I’ll be surprised if that’s the case. Nico Rosberg took a big step forward in his 2015 championship campaign by winning the Spanish Grand Prix on Sunday. But there’s still an important step Rosberg needs to take if he is to challenge for the championship this season – he needs to beat Lewis Hamilton in a straight fight for victory. That didn’t happen in Spain. Let’s take nothing away from Rosberg’s Spanish Grand Prix performance. He did everything right. His race was faultless. He took pole, led from the start and didn’t put a wheel wrong all afternoon – all of which resulted in a commanding victory. The trouble was Hamilton was never really in the fight for victory. Having qualified second, Hamilton started from the dirty side of the track (the part of the track not on the racing line). He made a less than perfect start and was passed by Sebastian Vettel into the first corner. From then until the second round of pitstops, Hamilton was stuck behind Vettel, unable to get close enough to pass despite having a much faster car. Rosberg took full advantage of the situation and pulled away, creating a gap that Hamilton could not hope to close once he eventually passed Vettel using pit strategy. Full marks to Rosberg for controlling the race. But he will be aware that he did not actually out-drive Hamilton. At no point in the race did Rosberg have to pass Hamilton, or defend against him. Had Hamilton made it into the first corner second, instead of third as was the case, then the race would have been entirely different. Rosberg would have had to fight Hamilton for victory from lights to flag. As it happened, the two Mercedes drivers were not really in the same race, although they ended up finishing first and second in the Grand Prix. So Rosberg won fair and square. But at no point in the race was he actually racing Hamilton. In the entire weekend, Rosberg only really did two things better than Hamilton – he took pole, which is to Rosberg’s credit as that was a straight fight between the two Mercedes drivers; and he made a better start, which is at least partly the result of starting on the “clean” side of the track. So Rosberg’s satisfaction at winning the race, while significant, will be tempered by the knowledge that he still needs to assume some form of psychological ascendancy if he is to mount a serious title challenge. Admittedly, that wasn’t possible as the race played out on Sunday. Perhaps it will still happen. Fernando Alonso is one of the top drivers in Formula 1 at present, perhaps ever. And yet he has not won the Drivers’ Championship since 2006. Why not? I think it’s largely the result of repeatedly being in the wrong team at the wrong time. Consider Alonso’s career moves since starting in Formula 1. His career began in 2001 with Minardi, where he impressed enough in his first season to land a drive with Renault in 2003. Just a few years later, Alonso won back-to-back championships with Renault in 2005-2006. So far, so good. For 2007, Alonso switched to McLaren. The car was competitive. Alonso was in form. There was just the quite significant problem of a rapidly deteriorating relationship between team and driver. Alonso never felt at home at McLaren-Mercedes, as it was then, and at the end of the season he and the team agreed to part ways. Alonso went back to Renault for 2008. Unfortunately for Alonso, the 2008 Renault was nowhere near as good as that year’s McLaren. Alonso finished a distant fifth in the championship while Lewis Hamilton, in a car Alonso could have been driving, won the championship. Had Alonso stuck it out with McLaren, it is quite possible that the 2008 championship would have been his. Another season with Renault followed, in which it became apparent that the car was simply not good enough. Alonso failed to win a single race in 2009, and at the end of the season made a high-profile switch to Ferrari. From 2010 to 2013, Alonso gave his all for Ferrari, comfortably out-performing team-mate Felipe Massa and generally competing, to at least some degree, for the championship. But all four of those seasons were won by Sebastian Vettel for Red Bull. And here is perhaps the most unfortunate of Alonso’s career decisions so far. When he left McLaren to return to Renault for 2008, there was another team rumoured to be interested in his services. That team was Red Bull. Had he made the move to Red Bull, Alonso could quite conceivably have dominated Formula in the same manner that Vettel did. But it didn’t happen. Instead, Alonso went to Renault and struggled in an under-performing car. Alonso’s final season for Ferrari, 2014, was another year of struggle with an inferior car. The Ferrari power unit was no match for that of Mercedes, and Alonso once again was not able to challenge for the championship. In his most recent career move, Alonso made the switch from Ferrari to McLaren for 2015. The much anticipated reunion of McLaren and legendary engine supplier Honda was expected to provide Alonso with a way back to the top of the results sheets. But again, it seems to not have worked out, although it’s still very early in the season. Alonso missed the first race in Australia due to a concussion from a heavy crash in testing, but in his absence, McLaren drivers Jenson Button and reserve Kevin Magnussen were well off the pace, as Honda struggled to provide the power required for the car to be competitive. The McLarens occupied the back row of the grid in Australia, and look likely to be quite far down the order again for this weekend’s Malaysian Grand Prix. It promises to be a tough season for Alonso, unless Honda can get their act together quite quickly. And here again, Alonso seems to have made the wrong move. Or at least he appears to have moved at the wrong time. A resurgent Ferrari are currently best-of-the-rest to Mercedes, ahead of Williams to the surprise of the entire F1 field. Sebastian Vettel, who moved from Red Bull to take Alonso’s place at Ferrari at the end of last year, is revelling in the pace of the car and scored his first podium for the team at his first attempt. 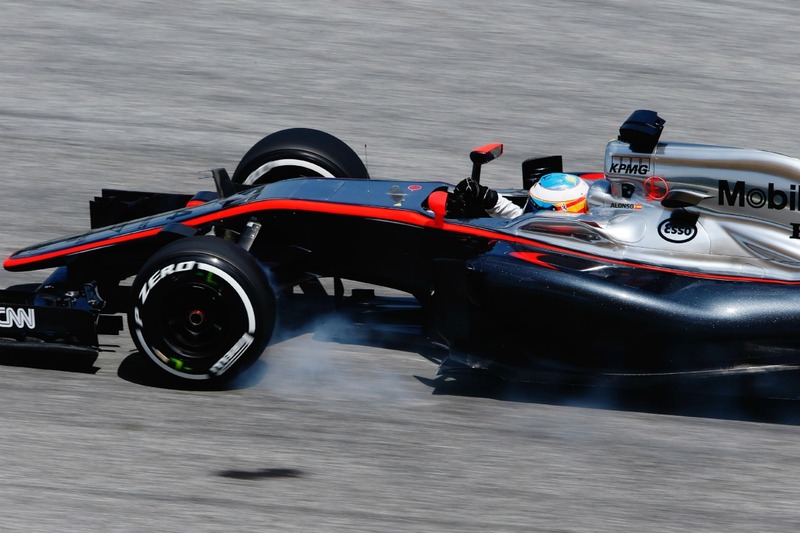 Will McLaren come good for Alonso? For the sake of Formula 1, one can only hope. It is a real pity that one of the true greats of the sport has had such poor luck with cars. Unfortunately, 2015 doesn’t look like being the year his fortunes will change. This gallery contains 16 photos. Jules Bianchi, the young Frenchman who drives for F1 backmarkers Marussia, deserves a seat in a top team. More specifically, he deserves to drive for Ferrari. Bianchi has impressed all the way through the single seater formulae. But since making it to Formula 1 at the beginning of 2013, he has consistently demonstrated the skill and maturity €required to merit a drive with Ferrari, the organisation that has backed his rise to Formula 1. Bianchi is part of Ferrari’s Driver Academy, and therefore has the support of Formula 1’s most famous team as he builds his career in motor sport. While that’s a great position for any young driver to be in, it’s becoming more and more clear that the question needs to be asked: Why is Bianchi not driving for Ferrari? A Formula 1 driver in a slow car has one major aim – to beat his team-mate. To say Bianchi has beaten his team-mate at Marussia is to make a quite ridiculous understatement. Bianchi has obliterated his team-mate – Max Chilton – since the first time he sat in the cockpit of a Marussia F1 car. But more than that, Bianchi has put Marussia on the F1 map. Significantly, he scored the team’s first ever points at the 2014 Monaco Grand Prix when he finished 8th (he was demoted to 9th as a result of a penalty incurred during the race). Today, Bianchi showed his class yet again, by qualifying 16th for tomorrow’s Belgian Grand Prix. 16th doesn’t sound particularly impressive, but consider that Bianchi was over a second a half quicker than his own team-mate in Q1 and matched the Q1 lap time of Sauber’s Adrian Sutil. Whenever difficult conditions present themselves – like in today’s wet Belgian GP qualifying session – Bianchi performs extremely well. Whenever conditions are ideal, Bianchi generally outperforms his team-mate. More cannot be asked of a racing driver in any category. Ferrari’s drivers in 2014 are Fernando Alonso and Kimi Raikkonen. Both are former world champions, which is very unusual for Ferrari – before signing Michael Schumacher for 1996, Ferrari had typically employed up-and-coming drivers and until signing Kimi Raikkonen for this season, Ferrari had never re-employed a former Ferrari world champion. 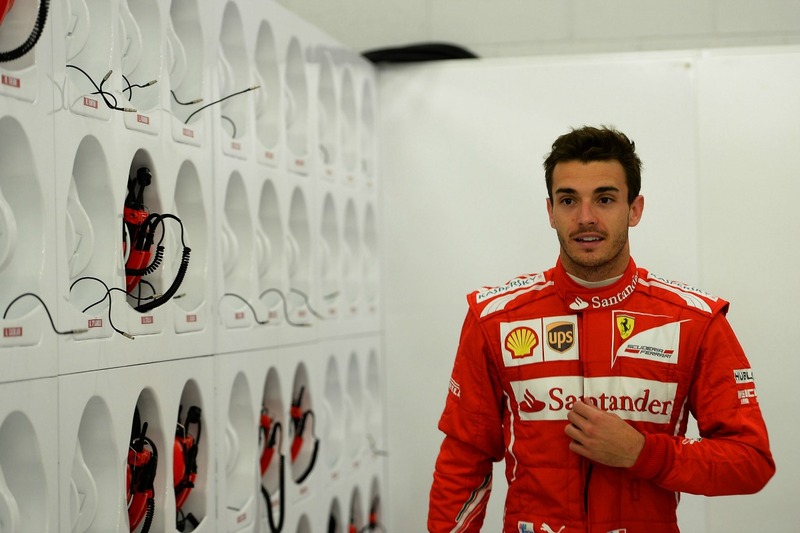 Jules Bianchi is the ideal driver for Ferrari. He has talent in abundance – that much is very clear. He has shown maturity and determination in his performances in Formula 1 – indicating that he would do the same for Ferrari. Bianchi is also young and has no particular achievements that demand a high salary (he’s not a world champion or even a race winner yet, mostly as the result of not having a quick enough car) – which leaves more of Ferrari’s budget available for car development. So why is Bianchi not driving for Ferrari? Honestly, I don’t know. If Ferrari don’t come to their senses and offer him a drive for 2015, it is likely that Bianchi will be winning races for one of the other top teams next season. 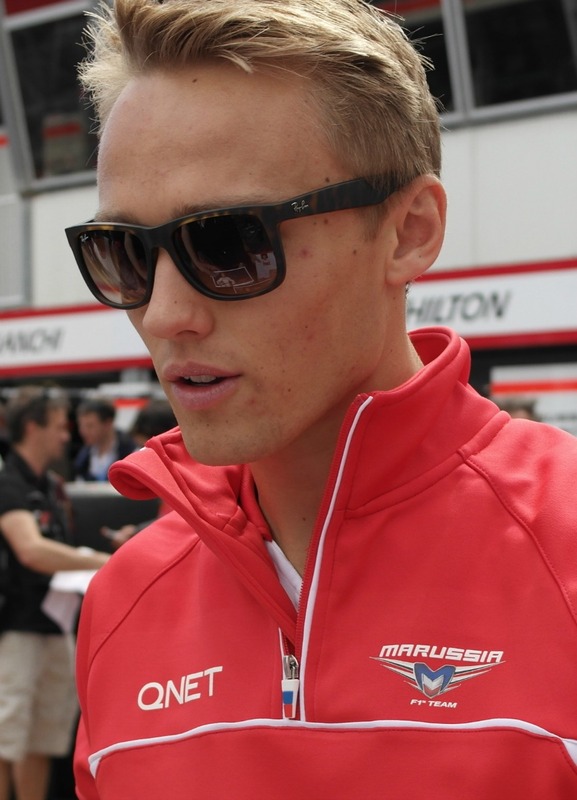 Max Chilton recorded his first ever Formula 1 retirement in Sunday’s Canadian Grand Prix. It’s probably the most important event that has occurred in his short F1 career thus far. Chilton has had a monkey on his back for some time now. That monkey has been his reliability. He finished every race of his debut season in 2013 and followed that up by finishing the first six races of 2014 – a run of 25 consecutive race finishes, which is impressive for any driver in Formula 1. The problem was it became his claim to fame. Chilton was the driver who finished every race. It’s certainly not a problem to finish races. Finishing is essential to results. But finishing is not a result in itself. Winning is a result. Finishing on the podium is a result. Finishing in the points is a result. Finishing ahead of your rivals is a result. Finishing ahead of your team-mate is a result. While Chilton was notching up his impressive run of race finishes, his team-mate, the ever-impressive Jules Bianchi, was notching up results that displayed his immense promise as a Formula 1 driver. He comprehensively outperformed Chilton in 2013 (the debut season of both drivers) and most recently scored the Marussia team’s first ever points by finishing 9th at the Monaco Grand Prix. Where do Chilton’s 25 consecutive race finishes rank next to Bianchi’s 2 point in Monaco? Nowhere. Nobody cares that Chilton has been reliable to an unlikely degree. It’s results that count, not race finishes. And that is why it’s crucial that Chilton had to retire from a race. After 25 consecutive finishes, it’s likely that he felt some pressure to make it to the finish line simply so he could avoid failing to finish. But that’s not the point of racing. Results are the point of racing. Chilton can now focus on results. He starts with a clean slate at the next round in Austria. It’s a neutral venue, in that it’s not his home race, nor is it the home race of his team or any major partner of his team. There’s no specific pressure. It’s just another race where he gets to go out there and do the best he can with the car his team prepares for him. Perhaps we’ll see Chilton really start to challenge Bianchi in the near future. Until now, he’s hardly done so. But the freedom that comes with getting that monkey off his back can only do him a great deal of good. The 8th race of the 2015 F1 season at the Red Bull Ring, Austria!